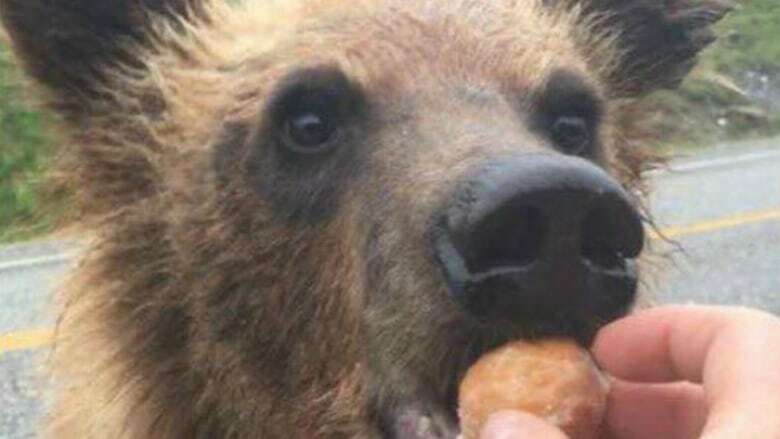 Two people have been charged after British Columbia's Conservation Officer Service says they posted photos of themselves on social media hand feeding Timbits and hot dogs to bears. Conservation officer Sam Harris says it's alleged the man and woman were feeding bears from their vehicle as they drove along the Alaska Highway. He says the charge under the Wildlife Act says a person must not intentionally feed or attempt to feed dangerous wildlife. The pair are due to appear in a Fort Nelson court next month. A photo tweeted by the service shows what Harris says is a young grizzly being hand fed a Timbit. Harris says someone tipped the service to the photos posted on social media, which led to the charge. "Our big concern with people feeding bears is that once a bear becomes habituated to people and he starts associating people with food, then they become a danger to the public," he said in an interview Wednesday.